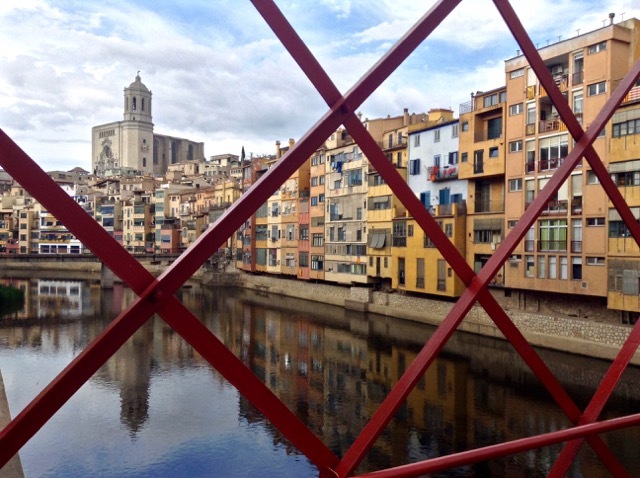 The handsome city of Girona in far northeastern Spain had long been on my to-visit list, becoming irresistible after a series of sensational blog posts and Instagram photos from friends I follow came across my feed. After all, who could resist a city that gets festooned with an avalanche of flowers every spring, that boasts a strikingly-red Eiffel Bridge, and that is home to the Best Ice Cream in the World™? 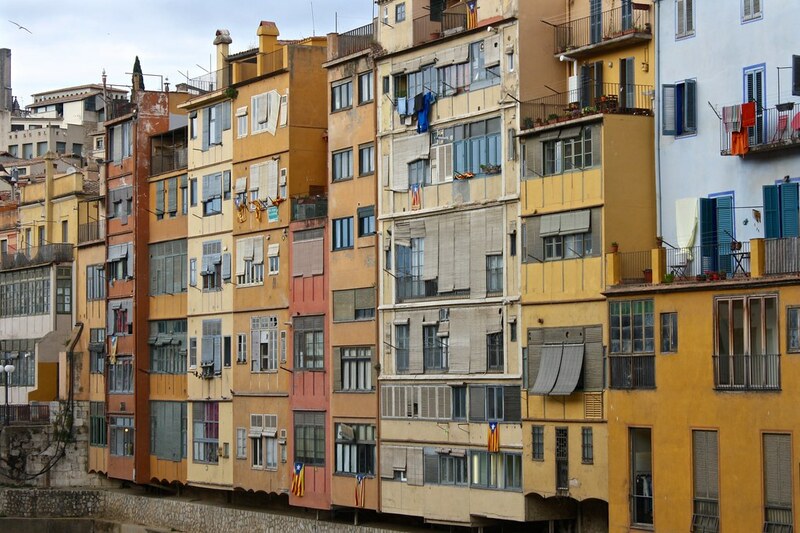 You might think that Girona (pronounced “zhee-ROE-nuh” [ʒiˈɾo.nə]) would be totally overshadowed by its neighbor Barcelona to the south, but sitting a 40-minute train ride away lets this provincial capital carve out its own unique character and feel. And that personality is 100% Catalan, making Girona a perfect place to experience what makes the northeastern region of Catalunya so special. 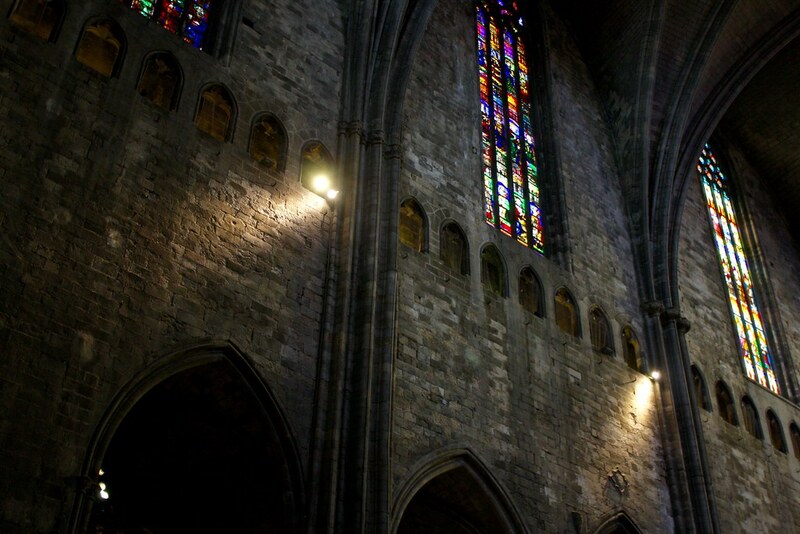 As part of my final trip around Spain before moving back home, I spent three nights in this fabulous city and got more deeply acquainted with what makes Catalan culture unique than I would have otherwise as a tourist in Barcelona. When I visited Girona in June of 2015, the regional government of Catalunya had just held an (illegitimate) referendum on independence from Spain that past November. 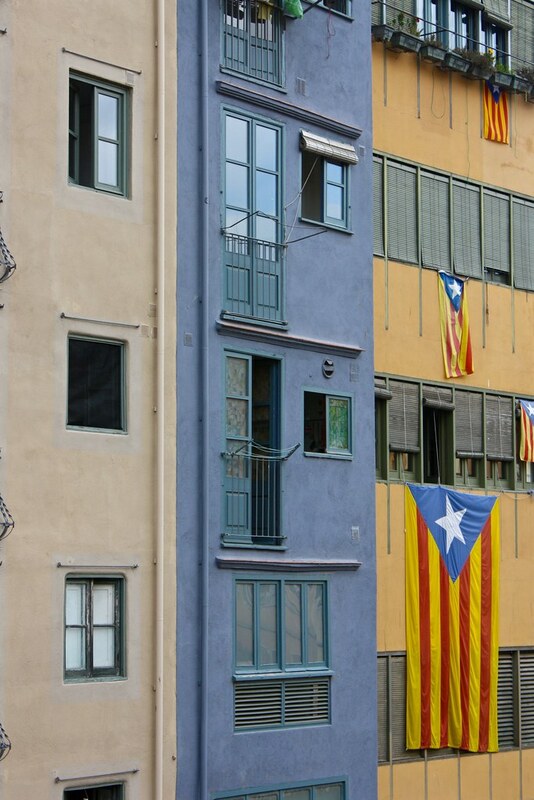 So it was only natural to see Catalan flags of both the regional and separatist (blue triangle + white star) varieties being flown from windows and balconies all over town. 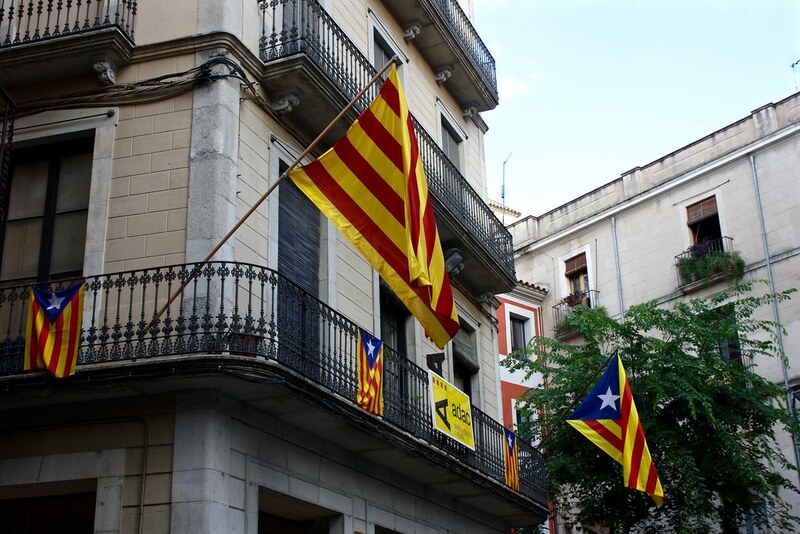 These flags are a common sight across a region whose residents are more likely to self-identify as Catalan first, European second, and Spanish…only if they need a passport. The mayor of Girona belongs to a pro-separatism party, to boot. As I strolled through the old town, I came across a shop that had been converted into an information center for Catalan separatism with a huge banner proclaiming a myriad of statistics that supported Catalans creating their own country (and to be fair, it was pretty convincing, even in the original Catalan!). The banner did leave off one critical piece of information: an independent Catalunya would remain outside the institutions that have ensured its prosperity over the years, like NATO, the borderless Schengen Area, and, most significantly, the European Union. But hey, not my circus, not my monkeys, as they say. 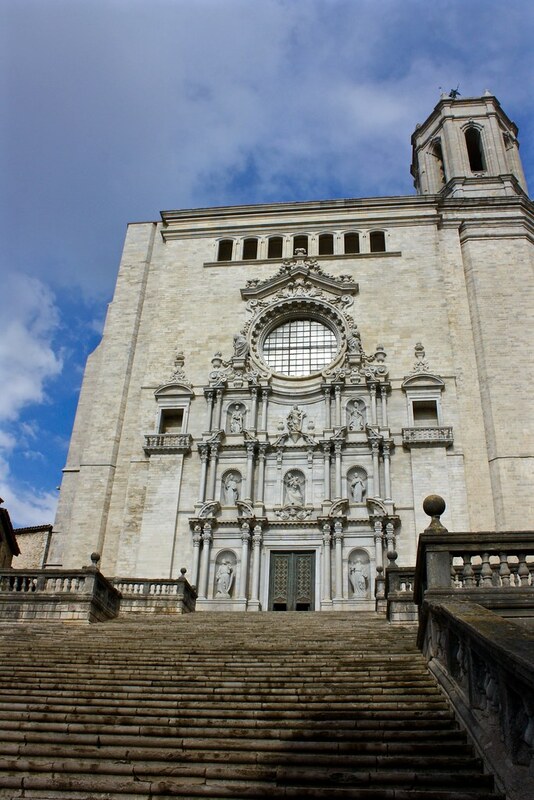 Girona’s situated just to the south of the lowlands that make it possible to move between Spain and the rest of continental Europe, so as you can imagine the city has been at the crossroads of the history that has shaped not only this distinct region of Spain but also Europe as a whole. The city began as Roman Gerunda, a major fortification at the confluence of several rivers. Over the centuries it would pass from the barbarian Visigoths, to the Moors based in Andalucía, to Charlemagne of France, and finally to the Counts of Barcelona. The imposing location of the current Christian cathedral has in the past been home to a Roman temple and a Muslim mosque. 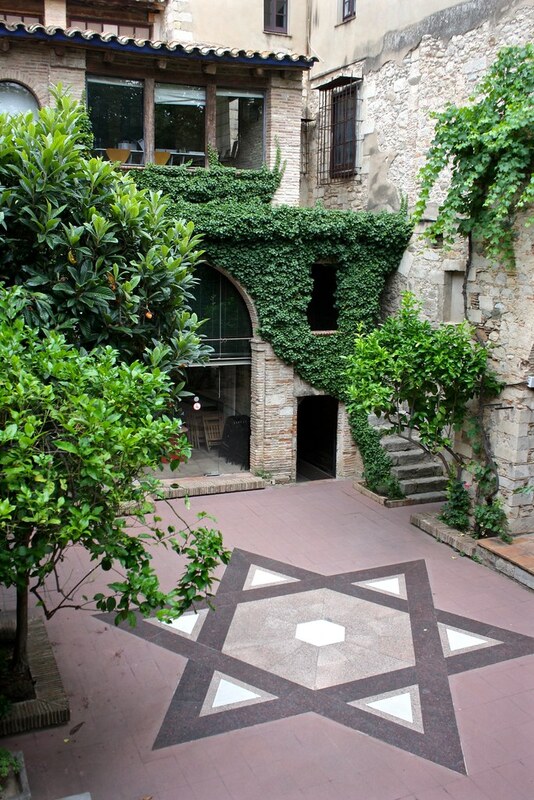 Up until the Jews were expelled from Spain in 1492, they made up a thriving element of the community in Girona’s Call or Jewish quarter. 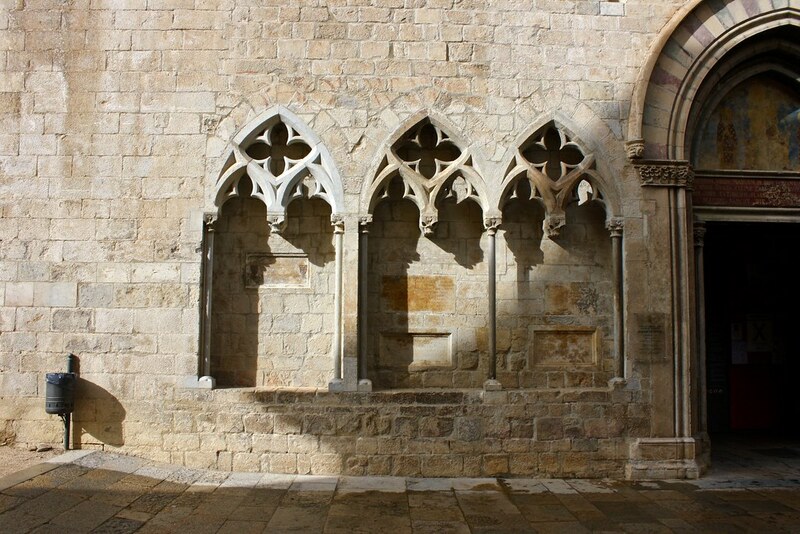 Today the city honors its lost Jewish heritage with a history museum housed in a medieval building with an original Jewish mikveh, or bath for ritual immersion. Girona quickly industrialized at the turn of the century along with the rest of Catalunya (unlike the rest of Spain at the time). 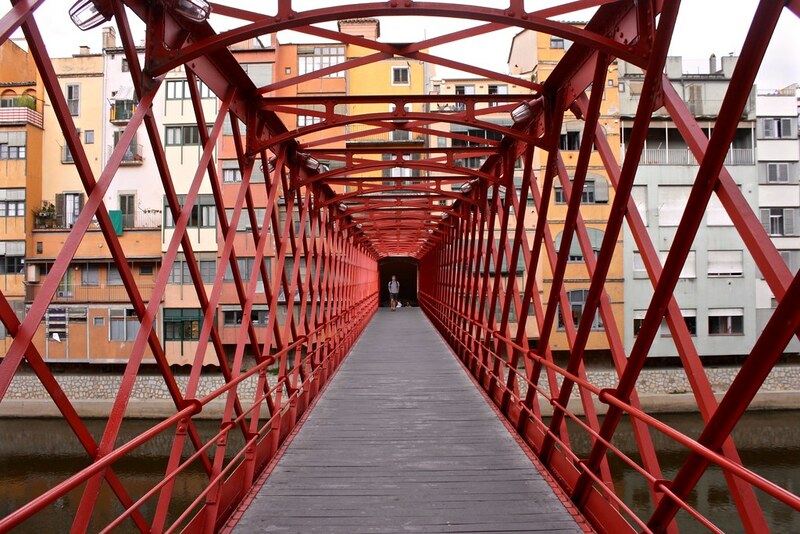 Epitomizing this industrialization is a striking red iron bridge that spans the Onyar River in the heart of the old town, designed by none other than Gustave Eiffel himself. Today the bridge offers a way to get postcard-perfect shots of riverside Girona framed by the diamond-shaped beams that support the bridge. 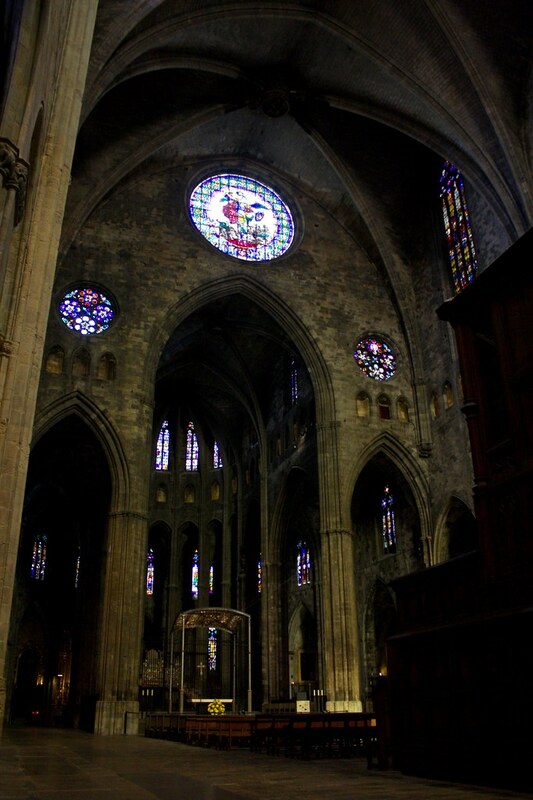 If I ever get around to writing a blog post about my top 10 favorite cathedrals in Spain, Girona’s will definitely show up on that list, if only because it’s such a glorious example of Catalan Gothic architecture, which features wide interior spaces, vast flat/unadorned walls, and octagonal towers. You reach the cathedral via a monumental staircase 86 steps long…just as you would have done in Roman times to reach the main temple. An ornate Baroque façade completes the overwhelming scene, one that will also exhaust you after climbing up all those stairs. Within, you’re really taken aback by the sheer immensity of the church, which contains a single nave rather than the typical central nave flanked by aisles on either side with separate arches and columns. The triforium or arched gallery that runs along the entire length of the cathedral seems punched out of the walls, and the occasional tourist that passes from window to window appears even tinier when compared to the enormous clerestory windows above. 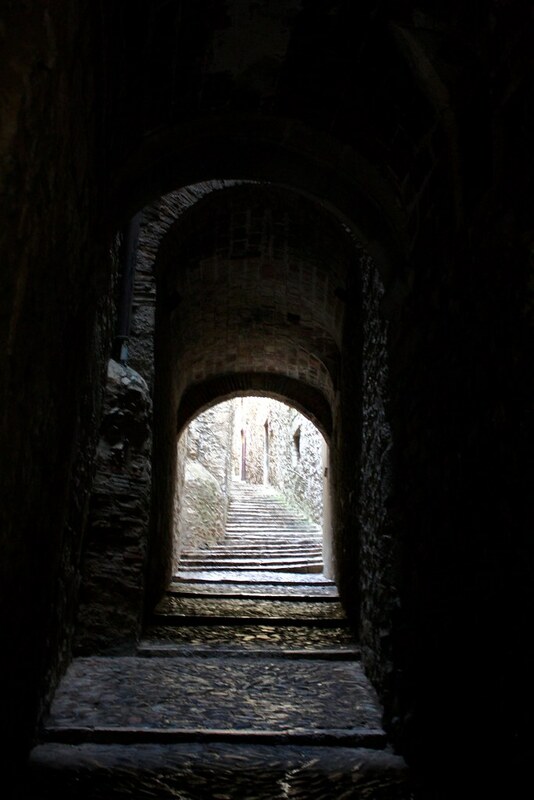 This whole gallery really dazzled me when I was there as it feels like something taken out of a fantasy tale where secret passageways connected sprawling palaces and castles. Don’t get me wrong, Spain is a truly beautiful country, but there are many regions that are just plain drab, home to little more than flat agricultural plains with farming towns falling apart due to neglect or provincial capitals that exploded in population under Franco and now boast block after block of ugly ‘70s-era apartment units. 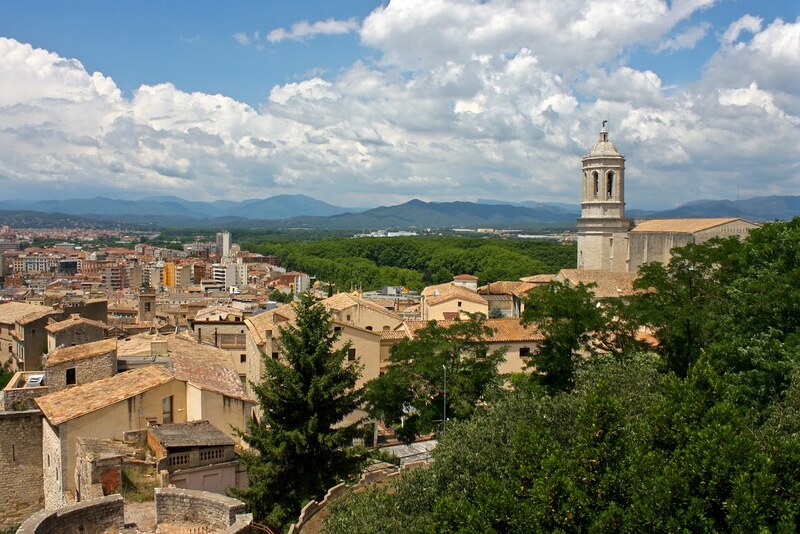 Catalunya is not one of these regions, and Girona is no different. 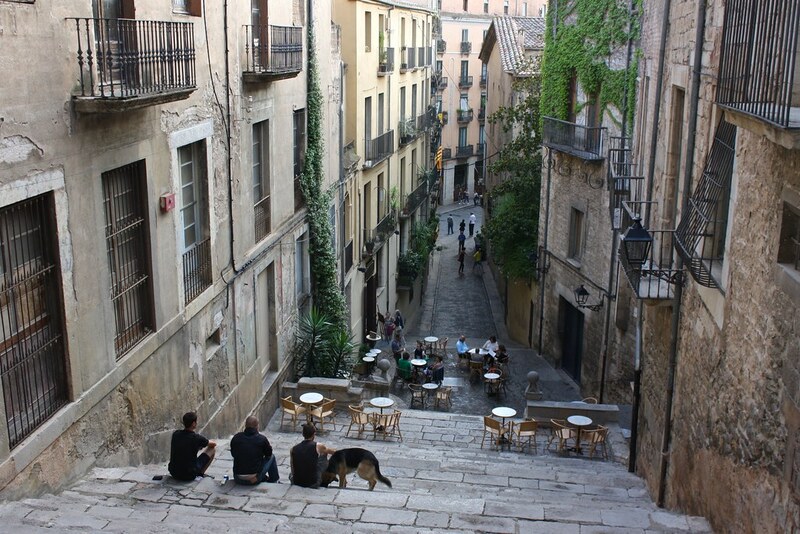 Cobblestone streets take you through shaded medieval neighborhoods out to the Onyar River, over which hang houses painted in earthy tones like ochre, goldenrod, and salmon. A host of stunning Romanesque and Gothic churches punctuate these pleasant homes, each overflowing with exquisite sculptures. And surrounding it all is a lush natural setting of rolling hills, forests, and farms that continue into the distance. Just around the corner from the red Eiffel Bridge you’ll find the Rocambolesc ice cream shop on the main shopping drag. The prices are astronomical…and the ice cream combos they mix up feel truly galactic. 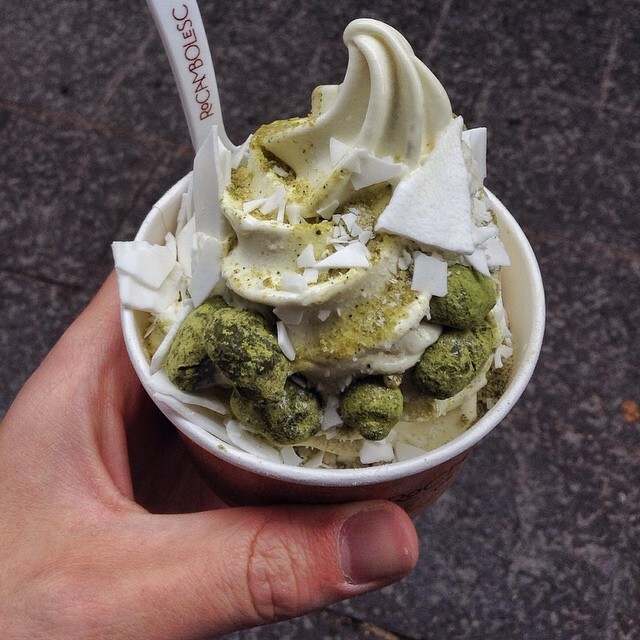 My green-tea fro-yo came topped with candied pistachios, mint sugar, and something crunchy flavored with eucalyptus. Over-the-top, most definitely, but this glamorous bowl of ice cream felt right at home in such a gorgeous city. 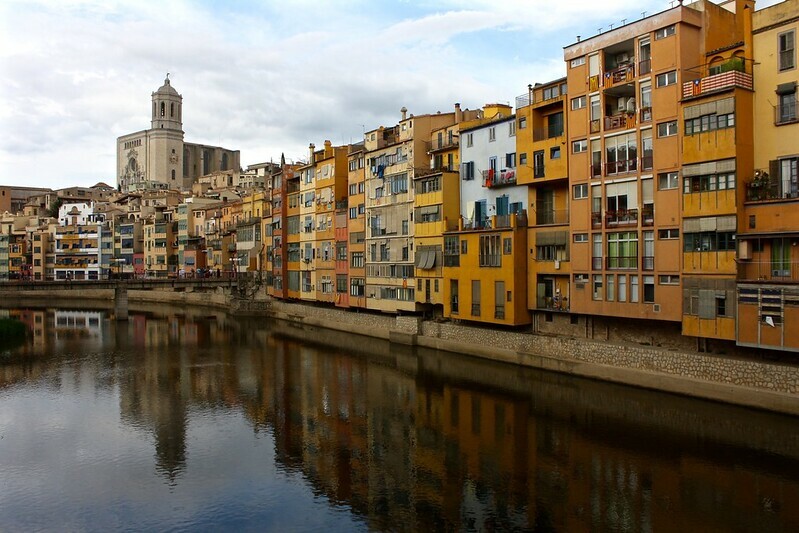 Have you been to Girona before? Where else can you find the essence of Catalunya in Spain? Share your thoughts below in the comments thread!